Arthur's Pass (el. 920 m.) is a mountain pass in the Southern Alps of the South Island of New Zealand. It marks part of the boundary between Westland and Canterbury, 140 km from Christchurch and 95 km from Greymouth. 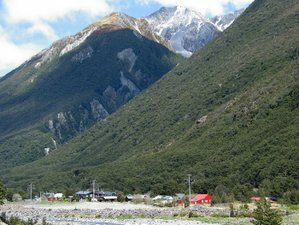 The pass lies in a saddle between the valleys of the Otira River, a tributary of the Taramakau, in the west and the Bealey River in the east. Arthur's Pass lies on the border of the Selwyn and Grey districts. 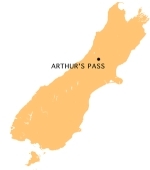 A hamlet of the same name (Arthur's Pass) is located about 5 km south of the mountain pass. The pass is named after Sir Arthur Dudley Dobson (1841-1934), who led the first party of Europeans across the pass in 1864. He had been informed of the presence of a pass which had been used occasionally by Maori hunting parties by a West Coast Maori Chief, Tarapuhi. It is also believed that writer and explorer Samuel Butler had seen the pass several years earlier, but was unable to explore it at that time. The timing was perfect, as the West Coast was soon to be hit by a goldrush, and easy access to the Tasman's coast became imperative. 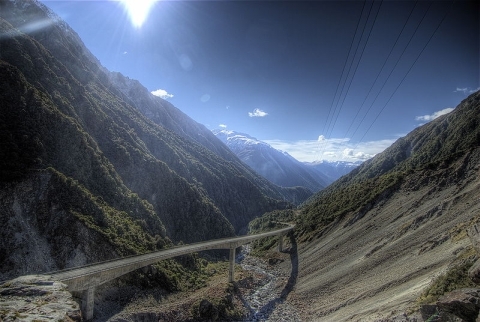 State Highway 73 passes over Arthur's Pass and is the highest of only three roads crossing the Southern Alps, the other crossings being the Haast Pass and the Lewis Pass. 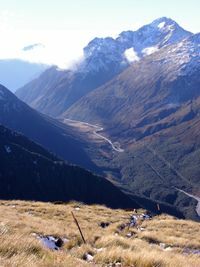 However, Porter's Pass, on the same road, is higher than Arthur's Pass (about 940m) but it is not considered one of the alpine passes as it is located in the Canterbury foothills not far away from Springfield. Previously prone to be blocked by landslides or avalanches, the road on the western side of the pass has seen extensive civil engineering work in the late 1990s. Most notably, the impressive Otira Viaduct, near the settlement of Otira and spanning 440 metres of unstable terrain, was completed in 1999. The Midland Line, connecting Christchurch and the West Coast, crosses the Main Divide by means of the Otira Tunnel, between Arthur's Pass township and Otira. When opened in 1923, the tunnel was the longest in the British Empire. This tiny hamlet is a popular base for exploring Arthur's Pass National Park. Christchurch . Rolleston . Darfield . Springfield . Cass . Arthur's Pass . Otira . Jacksons . Moana . Brunner . Greymouth. Arthur's Pass township, a hamlet about 5 km south of the pass, is a popular base for exploring. Its elevation is 740 metres above sea level surrounded by beech forest. There is a ranger station and a small display room. There are also several good walks from here including the Devils Punchbowl falls. And the mischievous kea (New Zealand mountain parrot) can be found here.